Submit a video, story, poem, artwork, or audio clip telling us about your experience with transitioning to adulthood. We would love for you to share your success stories about preparing for or finding a job, navigating postsecondary education, or identifying a community resource or piece of assistive technology that really worked for you, or your son or daughter. Deandra Bardell, a PACER Intern, is a University of Minnesota Twin Cities, College of Science and Engineering student. She has Cerebral Palsy and uses a power wheelchair. In May 2018, she completed her Bachelor of Science in Mathematics, and is pursuing her second B.S. in Computer Science. 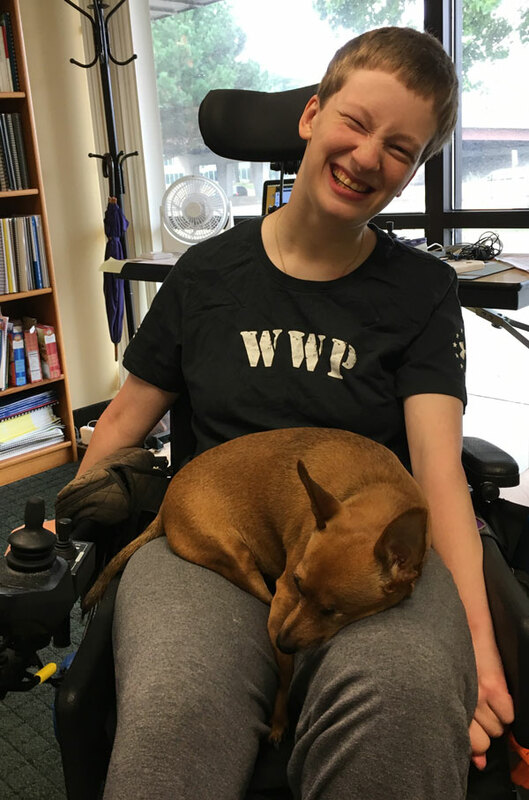 In this article she shares her experience working with the University of Minnesota’s Disability Services Office and offers tips to help other students navigate academic accommodations and find success at college. I chose the University of Minnesota (U) partly because of its size. I knew navigating the campus would be more of a challenge compared to a smaller school, but I also knew the larger Disability Resource Center (DRC) would have a greater ability and more resources to accommodate me. I’m a very academically driven student, so making sure I would get my needs met was very important to me. I started at the U when I was 17 years old. Because I was a minor, my parents were automatically allowed to talk to the DRC and they could share my information with them. Once I turned 18, I had to meet with my specialist to sign privacy agreements, and I chose to sign paperwork that allowed my parents to communicate with the DRC if I needed their help. At the beginning of every semester, at least a week before classes start, I send every instructor an email with my accommodations letter. I tell them a little about myself, my disability and how it affects me, the lecture section I’m in, an overview of accommodations, and I request a syllabus. I ask them if they have any initial questions as well as when they would be able to meet during the first week of school. Over the years, I have learned that starting an open conversation early makes the class logistics smoother for both the instructor and me. By getting the syllabus early, I can think about accommodations and potential issues. This way, when we meet in person, I am prepared with points that I would like to address. If my professor doesn’t understand or disagrees with an accommodation, I try my best to resolve the concern. If I’m unsuccessful, I ask the DRC to get involved. Most of the time, the issue is a misunderstanding, and the DRC brings clarity to the situation. Rarely an instructor refuses to accommodate, and the DRC can’t force them to do so. In this case, I try my best to get through the class, or I drop the class. Due to Cerebral Palsy, I am unable to write, have difficulty speaking, and I use adaptive equipment to use my computer. I have Access Assistants (AAs) in all my classes to take notes, and in labs to help me with hands-on activities and communicate if someone doesn’t understand my speech. AAs are assigned all semester long, and if one is gone, the DRC tries to find someone to fill in. If the DRC doesn’t get advanced notice, sometimes an AA doesn’t come, and I have to get notes some other way after class. If I’m not going to be in a class, I have to tell the DRC as soon as possible so they don’t send someone. If I’m not in class, the AA will not take notes. If I’m more than 15 minutes late to class, the AA can leave. Both of my degrees require physics, math, and other technical labs. When I first started classes, many of my AAs didn’t have the background knowledge needed to properly help me in labs. I needed AAs that knew basic math and graphing skills so when I told them to draw a vector or points on a graph, or write math symbols, they knew what I meant. Trying to explain how to write something down takes valuable time away from doing the actual work. With advance notice, the DRC found qualified people to help me in labs. For computer science labs, it would be very difficult to tell someone how to write code, even if they were in computer science. The best solution for me is to explain to my instructor that I cannot use a lab computer, and that I will complete the work outside of lab with my own computer setup. For my lectures, it’s nice to have AAs that have knowledge in the course topic. They use their judgment on what is important to include in my notes, and if they have an idea of the material, they better understand what I would find useful in my notes. However, most the time I’m fine having an AA with no experience in my field. I understand how difficult it can be to find a qualified student that doesn’t have an overlapping schedule. I receive testing accommodations. I’m allowed a private room with a proctor, extended time, breaks, a testing computer, and assistive technology. The DRC has a Testing Center, and the AAs help run it. The DRC purchased the assistive technology I need to operate a computer, downloaded software, and I have my own account on the computer so my settings are saved. The Testing Center is open normal business hours, and extended hours during finals. Instructors usually want students to take exams at the same time as the class, which is a problem if the class is at night. In this case, the student may be able to take the exam at a different time. Due to my extended time, I almost always need to schedule an alternate time. Exams have to be scheduled at least a week in advance. If it’s less than a week in advance, the DRC can deny the request. They need time to schedule exams, get instructor approval, and have the exam ready. The first few years, I stayed in a newly built dorm. Most of the dorms are quite old, and not very accessible. Fortunately, the DRC helped me to get a private room in the new dorm. My door had keycard access with an automatic button. The rooms are small, so I had the bathroom and closet doors removed. They also got me an adjustable power table. The cafeteria was on the main floor. It surprisingly wasn’t that accessible. The tables were close together, and it was impossible to find a seat during peak hours. There were multiple food stations with different options, which was nice. The portions were small, so students had to grab a plate, eat, and go stand in another line. Since it was so hard to get around, I would stay at a table while my PCA (privately funded, not provided by the University) repeatedly went to get food. One year I tried to get out of the food plan, but since I wanted to stay in the dorm, I was required to buy a plan. I don’t live too far from campus and didn’t stay at the dorm every night. Part of the time I used my dorm as an office. Since I need assistive technology to work on my assignments, I cannot go to a library and do homework between classes. The dorm allowed me to leave my tools in my room, so If I had many hours between classes, I could go get something done. The dorm was useful in bad weather or a snowstorm. If commuting was going to be especially challenging, I stayed in the dorm. Then, I would only have to get to a building from my room on campus. The U has a transportation service for people with disabilities on campus. I’ve never used it because I would have to schedule in advance and then wait for them to come. I would rather “walk”. The U has a tunnel system. I wish the DRC would have given me a specialized tour as a person with a disability. It took me at least two years to figure out all the connections. It’s quite useful as long as the doors into it are unlocked. Not all buildings on campus are accessible, but if I can get into a building connected to the building I need to be in, I can get there by tunnel, though it takes more time and effort. The U is pretty good about clearing snow from sidewalks, but not curb cuts, ramps, or handicapped parking spots. Every year I get stuck in the snow. Luckily people nearby see me and come to my rescue. After my first semester, the DRC approved me for priority registration. The first day of class registration, I can register instead of having to wait for weeks. This way, I can enroll in courses I know I can get to, and schedule courses close together that are on the same day. I also have a credit exemption. Because it takes me longer to physically do my work, I take 10-12 credits per semester. With the exemption, I receive full time student status even though I take under 13 credits, and I only pay for the credits I take, instead of having to pay for all 13 credits. The DRC turns my books into pdf, as long as I buy them at the bookstore. They have an agreement with the bookstore to be sent a copy of the book at no cost. Then, the DRC can cut the binding and scan the book for me. It takes a few weeks to get the pdf. I like to use the hard copy as well, though I tend to rip pages. If I rent a textbook, sometimes they threaten to not accept it back, but after advocating for myself, they do. Overall, my time at the U has been a positive experience. The Disability Resource Center and my specialist have been supportive and helpful. Disability Services in general help with reasonable accommodations. I’ve found that the definition of reasonable varies, and sometimes I’ve had to advocate why an accommodation is reasonable. It’s very important to advocate for your needs, and stay in touch with Disability Services. If you feel you need support during your post-secondary experience, contact your school’s Disability Services or Student Services as soon as possible. If you feel your school is failing to provide reasonable accommodations, find out how to file a complaint or appeal at your school. You can also contact PACER Center for information on your educational and legal rights. It was just seven months ago that Paris Clifton walked into the Minnesota WorkForce Center in Marshall, Minn., referred by the special education department of her high school. Paris, who is diagnosed with an emotional/behavioral disorder, entered a program for young people with disabilities through Southwest Minnesota Private Industry Council, a WorkForce Development Area that trains workers to fill needed positions. PACER is a partner in this DEED program. Paris told Leah Hastad, the Council’s Disability Resource Coordinator, that her dream was to one day own a restaurant. Together, the two mapped out a plan that combined training, education, and practical experience. Hastad and her colleagues work with individuals, tailoring programs to fit their needs and skills. Hastad said, “When I first met Paris, she had just graduated from high school.” Hastad placed Paris in a job at a long-term care facility in the dietary department. “This provided her with work experience on a job site,” Hastad said. The Southwest Minnesota Private Industry Council paid Paris’ wages through their work experience program, and the employer mentored and coached Paris, who worked with the cook and took food orders from the residents. The job was a success. After the trial period, Paris was hired by the facility — first part-time, then full-time. “She is even helping to train some of the new employees,” Hastad said. “She has come out of her shell and really flourished. She’s picked up extra shifts. Paris has her own apartment and although she is working full-time, she also has a second job at a convenience store. “Paris’ employer reports that she has grown in her position, and that the residents and the staff are very glad to have her there,” Hastad said. Part of the work of the Southwest Minnesota Private Industry Council is building on career pathways. College is in Paris’ future, Hastad said. “Paris wants to work on her basic skills to get into college. She will first work toward an associate degree online; if that goes well, Paris may be interested in transferring to the culinology program at Southwest State University,” Hastad said. Culinology is a new discipline; it is a blend of the culinary arts and food science. Though Paris’ apartment has wi-fi, she doesn’t have a laptop — something every college student needs. Hastad says that is something the Southwest Minnesota Private Industry Council can help with. Right now, Paris is so busy with work that finding time to complete her FAFSA (federal financial aid form) is a bit of a challenge. However, Hastad has no doubt it will happen. It’s in Paris’ plan. This article first appeared in the Fall 2017 PACESETTER newsletter. When Brad Hoyt saw his 12-year-old son, Ben, who has ADHD, struggling to finish his homework, sometimes working for as long as eight hours, he was greatly concerned. “We were at the point of switching schools just to get him the help he needed, and we visited several,” Brad said. A close friend suggested that Brad call PACER Center. “I spoke with Virginia Richardson,” Brad said. A meeting was arranged at Ben’s school that included Virginia (PACER’s Parent Training Center manager), Ben’s parents, and several school personnel, including the principal and Section 504 director. Two years later, Ben’s life has changed dramatically. After learning study skills and techniques in his classes and through the attention of his teachers, he made the “B” honor roll. “Most importantly,” Brad said, “We had our son back!” The six to eight hours Ben had spent on homework nightly dwindled to two to three. “He was happy again,” Dori said. Ben continued to thrive, and is now on the “A” honor roll and tennis team at school. “He was recently named an Outstanding Student along with only two others in his class of more than 300 students,” Brad said proudly. “His social studies teacher, who nominated him, said she was proud to be his teacher,” Dori reported. “She said that over the course of the year, Ben has become very attentive to who he is as a learner. He’s shown that he can accurately reflect on his progress and take action when necessary. This article first appeared in the Summer 2017 Pacesetter newsletter. “Where there’s a will, there’s a way,” is a good way to describe Marissa Leitzke’s attitude. The 17-year-old from Apple Valley, Minn., attends high school full time, volunteers for several organizations, runs track, and plans to attend college next year. 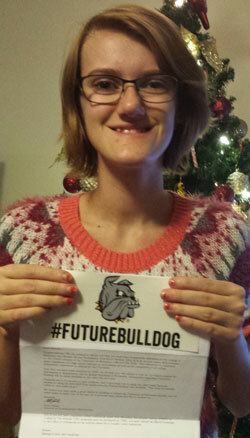 Marissa was born with Usher’s Syndrome, is deaf, and has progressive vision loss. She uses American Sign Language, a video phone, and interpreters to help her communicate. 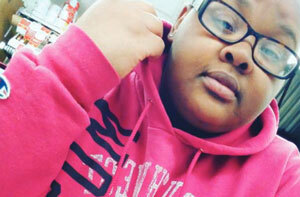 Marissa channeled her renewed self-confidence into teaching others how to stop bullying. For the past two years, she has organized events at her school to celebrate Unity Day, which was started by PACER’s National Bullying Prevention Center and takes place in October during National Bullying Prevention Month. “After going through my own bullying experience, I wanted to show others that it’s not OK and that they can stop it,” said Marissa. Active participation in her community is important to Marissa, and she has volunteered at her high school, church, and several non-profit organizations. In 2014, Marissa received the President's Volunteer Service Award for engaging in volunteer service and creating change in her community. As a child, Jessica Knoepfler was very introverted. She was uncomfortable in most social situations and went out of her way to avoid talking to people. It was only when Jessica persuaded her parents to buy and bring home their first dog, Abby, did her parents notice a change in their daughter. “Abby really brought Jessica out of her shell,” said Jessica’s father, Joel. “Soon everything was about dogs - Jessica spent much of her time with Abby, she did research on breeds and even presented a periodic chart of dogs to her classmates - something very out of character for Jess.” By the ninth grade, Jessica was already sure she wanted a career working with dogs. Jessica struggles with short-term memory. She requires repetition with new concepts to store information into her long-term memory, so the path to a career in dog grooming was not an easy one. After high school, Jessica was hired by two big box corporations in the Twin Cities to go through their grooming school and eventually work for them. She was terminated from the first one just before the end of her 90 day probationary period. She worked almost three years at the second and participated in their groomer’s training but unfortunately was only assigned to bathe dogs and not given the opportunity to groom. Both of these companies expected their groomers to whip through eight dogs per day and Jess wasn’t fast enough. There was also considerable turnover in their management, which didn’t help her situation. The truth was, Jessica was capable of doing a great job - she just needed more time to learn. Jessica did not give up on her dream, so the next step was to enroll in another grooming school. 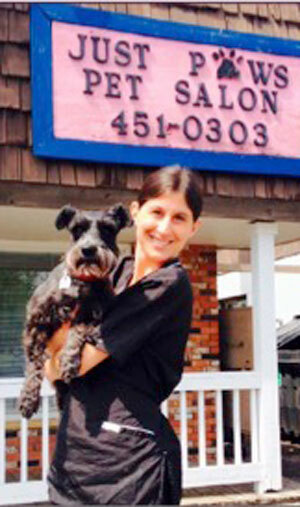 She trained at Rio Gran and only weeks after completing her training, she was hired by the owner of Just Paws in Lilydale. 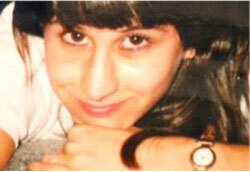 “Working for Brenda was the turning point for Jess,” said Jessica’s mother, Janet. “Brenda was patient and willing to mentor Jessica. She had suggestions on accommodations to help Jess through her learning period such as using a whiteboard to write instructions out for her daily cuts.” Jessica was happy and finally felt that she had found her place. Two years after Jessica was hired, a co-worker purchased the salon from Brenda. This change was unfortunate because it wasn’t long after the purchase that the new owner stopped showing up to work, started missing appointments and barely communicated with the staff. Jessica took responsibility for the everyday running of the business. Along with grooming several dogs per day, Jessica began making the appointments, keeping up the shop, ordering supplies, and cleaning. While the situation started off as an incredibly stressful one for her, it was during this time that Jessica began to really shine. She always had a sense of responsibility and a great work ethic, but this situation forced her to break out of her shell in order to save the business. In May of 2015, Jessica’s parents became official owners of Just Paws. “Jess has proven herself as responsible and committed, and we wanted to provide an opportunity for our daughter to continue to thrive.” Jessica and her parents recently hired a second groomer to help Jess out at the salon. “If her teachers saw her today, they wouldn’t believe it was her,” says Janet. “She has come so far!” Many times it’s about finding the right business or person to give you the opportunity you need to show your skill, passion and commitment. Just Paws gave her the opportunity to do what she had been dreaming of since the beginning of high school. “When she was given this chance to fulfill her grooming dream,” said Joel, “Jessica’s confidence grew in all facets of her life. This article by Kelly Ann Merchant was first published in the June 2015 issue of One Step Ahead, the monthly newsletter of Kaposia Inc., a customized employment program based in Little Canada, MN. Beverly Ofstie will never forget the day her son Jesse walked across the stage at his high school graduation in Southern Minnesota. “I’m not a crier, but I shed plenty of tears that day,” said Beverly. The Ofsties’ tireless efforts paid off. Jesse blossomed in the inclusive school environment and made many friends. He was the first student with cognitive disabilities at his school to participate in the typical high school classroom and walk in the graduation ceremony. “The other kids motivated him to learn and provided him with important social development skills,” said Beverly. My name is Ely Leuchovius Leslie, and I am an award-winning actor at my school. I’m a good person, my grades are fantastic, and I have a mountain of friends. 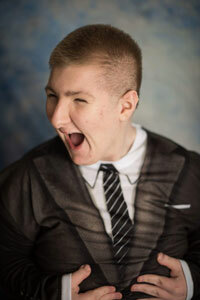 And I, an Aspergian (a person with Asperger’s syndrome), have been called upon to perform for television, along with a group of other young actors, in front of 2,000 people. It has always been my dream to perform in front of so many people. But it wasn’t always this way. When I was younger, I lived with my mother in Arkansas. I would lock myself in my room, never coming out to do anything but eat, before quickly retreating back. I spoke in a blank, monotone drone, which is rather typical for someone with Asperger’s. During recess, I’d simply stand motionless. I was the one weird kid who would never do anything and had no friends to play with. I hated everyone. I felt as though everyone hated me back. As a result, I was bullied profusely. Unable to handle the bullying, my mother home-schooled me. Having Asperger’s wasn’t a very easy thing for the doctors in Arkansas to understand. They misdiagnosed me with attention deficit disorder (ADD), schizophrenia, and chronic depression, but in reality, I only had Asperger’s syndrome. Since the doctors couldn’t treat me and I was taking more medicine than my brain could handle, I requested that I move to Minnesota and live with my father and stepmother. I felt I had to get out of that place. I was being doused for disorders I didn’t have and bullies I’d already left behind. Going to Minnesota was a chance to make a new start. When I arrived in my new home, I was behaving like a child. All the ridicule from my schoolmates and unnecessary chemicals buzzing around in my head—combined with my Asperger’s—took away my opportunity to mature like everyone else. My stepmother would ask me to fold towels for her, to contribute to the maintenance of the household. I’d simply cry out loud, at the age of 14, and tell her that I didn’t know how. She taught me how, whether I wanted to learn or not. They both taught me so many things, from how to hold a spoon correctly, how to do the dishes, how to put laundry in the machine, to where the detergent and fabric softeners went, and many other things. Those basic skills opened a pathway to learning more and more skills, which included the ability to converse with others. As an Aspergian, I had always been incredibly awkward around people. But in no time at all, my conversations with other people became more engaging and interactive. Was this the same kid who would stand and do absolutely nothing during recess? In my sophomore year I decided to join an improv skills workshop offered by the Autism Society of Minnesota. A group of Autistics gathered weekly to learn to become more outgoing, have fun, and to participate in a group of neurotypicals as though we were neurotypicals. * My interest in acting suddenly metamorphosed into a passion. I could shout as loud as I wanted, I could be improvisational and come up with new ideas, new plays, new characters to act out, new emotions to roll with, and it all felt so natural. This year, I tried out for a part in my high school’s spring musical, “Hairspray.” I was cast as Wilbur Turnblad, the father of the main character. He was the craziest, most energetic, and most perplexing out of all of them – an absolute perfect match for someone as idiosyncratic as me. I made many new friends at theatre, which was a huge accomplishment for me. I was even invited to a party for the first time in my life! When “Hairspray” closed, I learned I had been gifted with an Outstanding Actor in a Supporting Role Award. My first year in the Acting Guild, and I’d gotten an Outstanding Actor Award! I would be publicly televised along with other young actors recognized by the Hennepin Theatre Trust’s SpotLight Musical Theatre Program. I also earned a little trophy for being the “best newcomer” in the theatre! It was absolutely mind-blowing! I started from dirt. Then, I became a star. The entirety of this world has that same potential. Even if people are at a point where they can’t fold a towel, that doesn’t mean that they can’t grow. Anyone can shine. * PACER usually recommends "person first" language but we made an exception because it was Ely's preferred terminology. When Ann Motl signed up in 2003 for PACER Center's first EX.I.T.E (Exploring Interests in Technology and Engineering) Camp for middle school girls with disabilities, she had no idea that a few days of fun would change her life forever. Now 22 years old, Ann recently graduated from college with a Bachelor of Science degree in Mechanical Engineering. The daughter of dairy farmers Mike Motl and Kim Harff, Ann graduated from Staples-Motley (Minn.) High School in 2008. 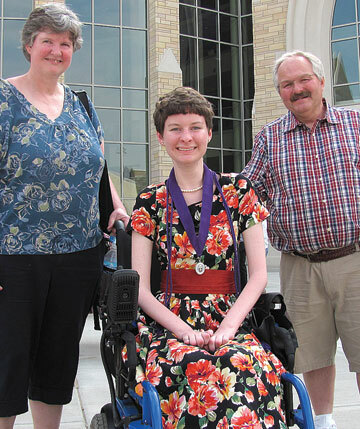 She compiled a long list of honors and achievements along the way, and was awarded the Board of Governors Engineering Scholarship at the University of St. Thomas in St. Paul. Following her college graduation in 2012, Ann completed a public policy and engineering internship in Washington, D.C., sponsored by the American Society of Mechanical Engineers. In the fall of 2012, she enrolled at the University of Minnesota Law School. Success hasn't come easy for Ann. She has Charcot-Marie-Tooth disease (CMT), a neuromuscular disorder. She has very limited use of her limbs and requires a power wheelchair for mobility. Like all good engineers, however, Ann is a great problem solver and she has overcome numerous obstacles that stood between her and her rather lofty goals. At St. Thomas, Ann lived in an accessible dorm room, utilized classroom note takers, hired personal care assistants, and employed various forms of assistive technology, including voice recognition software. She praises the university's disability services staff for working diligently to understand her requirements and meet her needs. They even helped Ann educate professors about her unique learning style so that she could have extra time to complete exams and assignments. Of course there are difficult adjustments every college freshman must make – particularly when moving from a small high school to an urban campus – not to mention the academic challenges involved. During her first year in St. Paul, Ann often went home from physics class crying. Over the next four years, no matter how high the barriers were, Ann never gave up, and she learned how to effectively advocate for herself. She credits PACER Center for providing the knowledge and resources that helped her secure the accommodations she needed to be successful. The results speak for themselves. “I decided at the end of EX.I.T.E Camp that being an engineer would be great,” she says. “Now I have my engineering degree, but I can do much more than that. My goals just keep growing. Who knows where I'll end up? Shortly after PACER opened its doors, Brian and Denise Walker moved to Minnesota. They brought their infant son Malcolm, frustrations with the East Coast medical community, and determination. 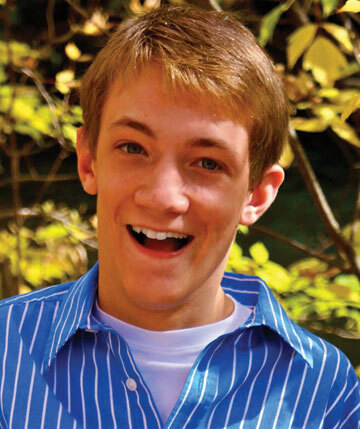 Malcolm was born with hydrocephalus, cerebral palsy, and developmental disabilities. Doctors told the Walkers that their son would never be able to hold up his head, never be able to ride a bicycle, and that his life expectancy was about five years. Medical experts recommended that Malcolm be placed in an institution and that the Walkers go on with their lives. "Well, we rejected that," said Denise emphatically. Soon after arriving in the Twin Cities, the Walkers contacted PACER. A long relationship ensued. PACER provided the Walker family with information and support throughout Malcolm’s childhood. 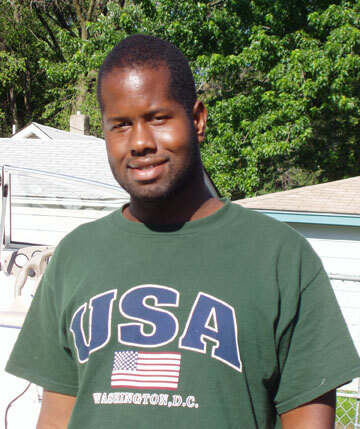 Brian recalled that PACER offered help for individualized education program (IEP) meetings. He remembers that PACER staff asked what dreams and aspirations he and Denise had for Malcolm—and PACER asked Malcolm what he wanted. The Walkers also supported PACER; Brian served on the board. Now in his early 20s, Malcolm works at Wal-Mart, is a talented cook, likes movies and sports, and is active in his church. He can ride a bicycle—and he recently bought a boat. "I don’t know how we could have done it without PACER," said Brian. Sam was 3 years old when his parents, Kathy and Hazen Graves, first brought their son to PACER’s Simon Technology Center (STC). That visit was the beginning of a fruitful relationship with PACER that has provided Sam access to new technology as it becomes available. It also led the family to become enthusiastic PACER volunteers.